HID headlights are growing in popularity across the world, with an increasing numbers of motorists choosing to make the switch away from factory standard halogen lamps. Across every major basis for comparison, standard headlights come off a poor second to the clearly superior technology of HIDs. This ensures road users can benefit from a much brighter, more illuminated drive, with headlights that are considerably more environmentally friendly than the standard. When it comes to installation, kits from XenonPro.com are designed to be as easy as possible to retro-fit, suitable for any car, and the process can be conducted without any specialist tools, knowledge or expertise. HID headlights operate in a fundamentally different way to halogen models, and this makes them a much more effective choice for most road users. It may be the case that you’re looking for headlights that simply look more aesthetically pleasing. Or you might be concerned with the safety implications of driving in poorly lit conditions. For some, it’s even a decision to reduce the energy consumption of their vehicle with the lights on. Whatever the reason, installing an HID headlights kit within your car can lead to a significant improvement in the driving experience. But what exactly are HID headlights, and how do these differ from the standard halogen models? What Is An HID Headlights Kit? HID headlights can be fitted to virtually any car, and the impact they can have instantly on the visibility and brightness of your drive is a significant improvement from the get go. In order to install HID headlights, you have two options. The first is to visit a local garage, who will be able to sell and install a system for you. However, these are often cheaper Chinese or other imports. This can be problematic in the sense that the bulbs are easily fissured, and can readily explode unless they are manufactured and handled in the most professional possible way. Additionally, buying a system from a garage will include an inflated price for both the parts and the labor involved in the installation. The best alternative is an HID headlights kit from XenonPro.com. Our kits can be retrofitted to your car without the need to visit a garage, or the need for any particular tools you might not otherwise have access to. There is no need to be an expert when it comes to the mechanics or electrics, and the whole installation process can be done with in a matter of just 15 minutes for each side. But only with a high quality German-made kit from XenonPro.com can you be certain that you will be able to effect the installation in the best possible way, without causing unnecessary damage to your car or danger on the roads. Because of the differences in the way halogen and HID headlights actually work, HID headlights bring a number of distinct advantages to the table. First and foremostly, these headlights are much brighter than the norm, when compared with halogen models. The light cast from these headlights is often as much as 3 to 5 times as bright as the standard halogen components, and this means that as a result they are much more effective at illuminating the road ahead. In turn, this means that they are the preferred model for those who are looking for headlights that can illuminate more of the road ahead, and make for a safer, much improved visibility drive. The main source of difference between the two is the mechanism by which each works versus the other. Rather than heating a filament, HID xenon lights push an electric current through the xenon gas, exciting it in the process and creating the much brighter, more efficient light that has given HID headlights their reputation. Whichever way you want to paint it, HID headlights are the premium choice, and one of the most effective options for anyone looking to maximize their performance. In an ideal world, car manufacturers would invest in HID headlights as a standard option, using the same to include as OEM on factory models. Of course, we don’t live in an ideal world, and where every penny counts, manufacturers will always opt for the lowest-cost acceptable option. Halogen lights can do the job, but they just pale in comparison to much more effective options like HID xenon headlights. Xenon headlights are brighter, more visible, and altogether a significant improvement on their halogen counterparts. As a result, they are much safer for driving in dark and low lighting condition roads, which makes them highly desirable for those who regularly drive at night. Xenon headlights last for much longer than standard halogen models, meaning you need to replace them on a much less frequent basis. To boot, there is also the energy efficiency point, with HID xenon headlights in particular coming in as being much more energy efficient than halogen. This also means the use less fuel than halogen, which essentially makes them cheaper to run on an ongoing basis. Switching from your current headlights to HID xenon headlights doesn’t have to be a big step, and with the right quality and type of kit, it can be possible to make the switch, or to revert back to halogen in the unlikely event you are not satisfied with the outcome of the upgrade. There is no need for any particular equipment, expertise or understanding – simply take the components of the kit we send you, follow the instructions to the letter, and start to enjoy your new, much brighter vehicle. The process generally takes less than half an hour, and the headlights are road ready from this point onwards. At XenonPro.com, we have the very best in kit quality available on the market, which allows us to guarantee happy customers, each and every time. 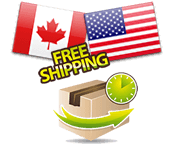 With express and same day shipping for customers across North America, there’s no reason not to visit XenonPro.com today, for immeasurable improvements in your driving specification.